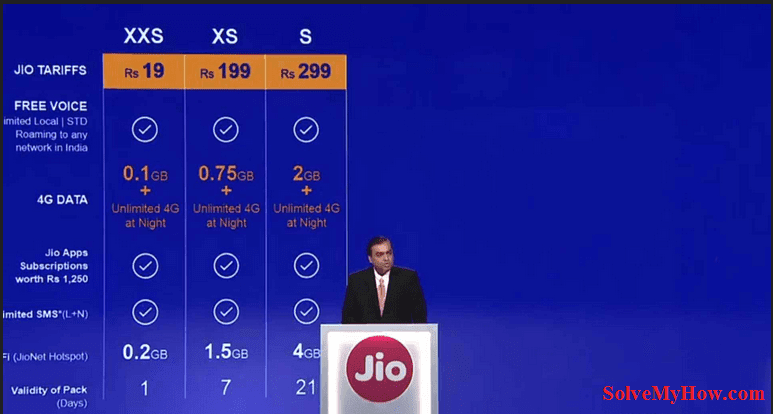 Reliance Jio 4G data plans. Reliance Jio launch has already made Indian's mad and now company has officially launched reliance jio 4g tariff plans in india of which Indian people were eagerly waiting for since last couple of months. So people are searching on Google for jio data plans or jio tariff plans 2016. Many people also ping me personally on Facebook and gmail and they asked me to write one complete post on reliance jio data card plans. 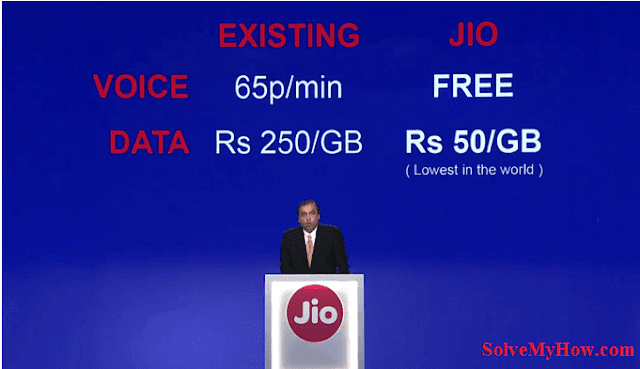 So here is the complete post for you on reliance jio 4g traiff or data plans 2016. I have give the entire list of 4g plans supportable by reliance jio 4g. Just read them one by and by and go for the one whichever plans suits you the most. But I must say reliance 4g tariff plans in india are really affordable. Reliance Industries is once again set to change the game of Telecom Industry but this time its not the Reliance communication but Reliance Jio is all set to make that happen. In the last post we saw how to purchase reliance jio 4g sim card and enjoy unlimited benefits for free. If you missed it, I recommend you to read it first. Its a well depth 1200+ words guide on how to buy reliance jio 4g SIM card. But for now lets concentrate on this post and lets see which are the most amazing reliance jio 4g data plans. Mukesh Ambani led Reliance Jio- a 4G LTE nationwide network carrier that promises the speed of 135 mb/s, free voice calling and roaming across the country. More over - No blackout days (no special charges on festival) and lower data charges than any other network in the country plus 25% extra benefits for students are few of promises that are kept by company, which made other telecom services provider rethink about their tariff plans. Mukesh Ambani’s offer is going to make a huge dig into the market, after Jio’s official launch which is set on 5th of September. Jio has also plan to offer JioNet 4g Wifi Hot-Spot across the country, off which the schools and colleges will be provided to use for free. Not only that Reliance has also offered 4G capable, VoLTE supported handsets under LYF brand starting at just Rs 2,999 and also wireless router for Rs 1,999. All the above mention things were made official during Reliance Industries 42nd AGM during which Mukesh Ambani also gave welcome offer to all customers under which all Jio Services including voice calls, apps, and 4G LTE data all would be available for free of cost to everyone from September 5 to December 31, 2016. The Jio’s data tariff plans are set as low as Rs 50/GB but there is mind blowing catch which you will find with the tariff plan shown below. Consumer should only pay only for one service i.e either for Data or for Calls. So keeping in mind above three principles the Jio 2016 has introduce following Voice Plan and Data Plans for consumer. Reliance Jio has decided to make their voice calls for free to any network across the country. Yes ! It is true. Reliance has made a remarkable move in telecom industry once again- first such move was made in year 2000-01 when Late Mr. Dhirubhai Ambani announced to make Incoming Call totally free and following his direction Mr. Mukeshbhai Ambani has announced to make Outgoing Calls Totally free for Jio customer. He stated- Reliance Jio will realize India's digital dream. It will fulfill Prime Minister Narendra Modi's Digital India vision. For free calls he said- Reliance Jio is built to speak Internet Protocol (IP). Most telecom providers haven't built their network for data or Internet, they have built it for voice calls. With the revolution of Internet, they have had to retrofit IP. Also he added that roaming across the country will be totally free and also International roaming charges will also be low as compare to others. The Jio data tariff plans are cheaper then any other country in the world. In Reliance 42nd AGM Mukesh Ambani said that Jio will charge a mere 1/10th of what its competitors are charging for 4G data services in the country. Other Companies plan for 1 GB of 4G pack is around Rs. 250/-, and on the other hand reliance will just cost RS 50/GB. He said that the company is prepared to change the industry for tariffs in India. All consumers will also get the benefit of Jio Apps subscription worth Rs. 1250 for free by subscribing any of the above mention plan. All the traffic plans except small data plans (XXS, XS, S) which aren’t having data validity of 28 days are not included in traffic plan for postpaid scheme by Jio. So this was all about Reliance Jio’s Data Tariff plans. Hope that you’ve got complete idea of Reliance Jio’s data Charges and also have got your idea as which plan is going to suit you according to your usage and budget. So this was all about Reliance Jio 4G data Plans in India 2016. I hope you found this post interesting and useful. Do let me know if you are having any problem in understanding any of the Reliance Jio 4G Tariff Plan in the comments below. You can also subscribe for SolveMyHow newsletter to get latest updates about Reliance Jio, Google and SEO high quality tutorials right into your inbox. Get 1TB + 2GB Free Google Drive Space - Definitive Guide!